By far the biggest improvement is the switch from the standard DisplayPort that we saw for Thunderbolt 1 and 2 to the more modern USB Type-C. Along with making it more modern and infinitely easier (since there is no wrong way to plug in a USB Type-C cable) it also provides Thunderbolt access to the USB protocol with Intel’s new Alpine Ridge controller, which was absent in the previous versions of Thunderbolt. This means Thunderbolt 3 has support for USB 3.1, Thunderbolt, DisplayPort, and PCI-Express protocols. This makes a lot of difference. The USB support means it can interact with USB devices directly, and also benefit from other USB features, such as being able to supply power, and although it only supports 15W by default it can optionally go up to 100W, which means you can, say, connect your notebook to a Thunderbolt 3 monitor and have the monitor also charge your notebook through the same connector, something you can’t do with Thunderbolt 1 and 2. The Thunderbolt features have also been enhanced and you now get an absurd 40Gbps of bandwidth, twice that of Thunderbolt 2, along with 10GigE Ethernet connection. 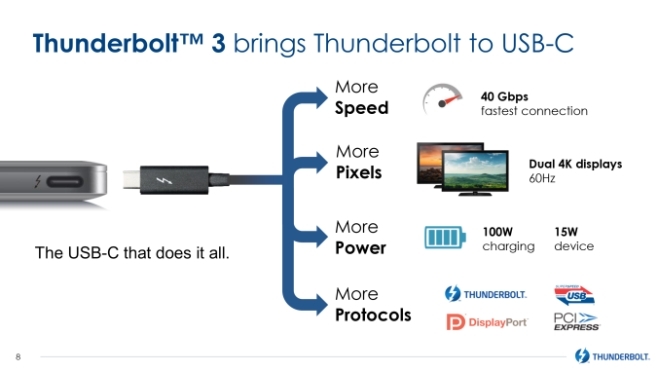 Thunderbolt 3 also features 2x DisplayPort 1.2 lanes, which allows a single Thunderbolt 3 port to carry two DisplayPort 1.2 signals, meaning you can connect a 5K60 MST display or two 4K60 SST displays on a single Thunderbolt port. Now for the coolest part. Since Thunderbolt also supports PCI-Express protocol, it could always theoretically support external graphics cards but that wasn’t enabled before due to certain issues. Intel has now taken care of those issues, which means you can now have an external desktop class graphics card powering your laptop through a single Thunderbolt 3 port. This should enable notebook manufacturers to ship lower power hardware on the notebook itself and an external GPU box for when you want to play some games. Not exactly a new concept but now made easier through Thunderbolt 3. Thunderbolt 3 devices should be coming out some time in the near future, and you can bet Apple is going to be all over it the next time it refreshes its Mac lineup, along with perhaps a Thunderbolt 3 enabled Cinema Display. It’s not exactly a cost effective solution so you won’t see it trickle down to the cheaper hardware but other non-Apple OEMs might adopt it in their future high-end products, especially now that it uses the more desirable USB Type-C port.